Much is being made in current UK advertising for the Volvo V40 of the fact that it is a Swedish car. There is a certain irony in this, of course, as the car is actually produced in Belgium. But then, finding out the true country of origin of almost anything we buy – not just our cars – is often quite difficult in these truly globalised times. Do people really care that their right hand drive BMW or Mercedes may well have been built in South Africa, or that the supposedly British MINI Countryman was actually made in Graz in Austria and that very German of sports cars, a Porsche Boxster really hails from Finland? Probably not. So many people are buying an image, and to them, the reality matters less. The point behind Volvo’s advertising, though, is that this is a car with a subtly different set of values from its competitors. The advertising agency, and indeed the car’s creator know that we all have a set of views what may be stereotyped view of “Swedish”, almost all of which are positive, around clean design, sturdiness, safety, practicality and a slightly unassuming competence, and by reminding us of some of these, they hope that they can tempt an increasing number of buyers of premium C-Segment hatchbacks out of their German cars and into this product instead. The V40 started off full of promise. 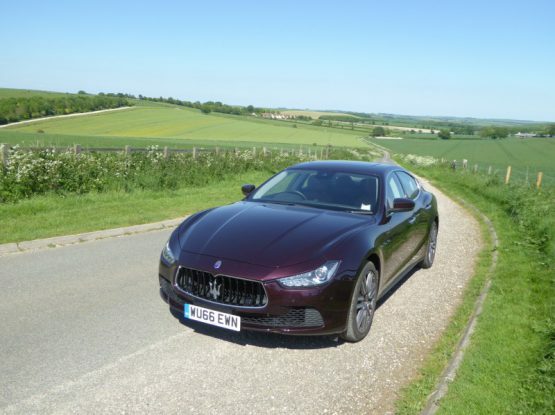 Launched in 2012, the initial reviews were extremely positive, though when the same press drove UK spec cars, they seemed to think something had been lost in translation, and they muted their enthusiasm somewhat. The market has largely agreed, with the car selling in decent numbers, but never likely to challenge the might of the Audi A3 and BMW 1 Series which dominate this sector of the market. It was a car that I was keen to try on launch, and although Hertz in the UK took delivery of a large number of them only a few months after the car went on sale in the UK, they never seemed to be available whenever I was sourcing a car from them, and it was not until December 2015 when Hertz Espana provided me with my first experience of the model, a white D3 car, for a weekend in Barcelona. It left me with positive impressions, but not blown away, if I am honest. 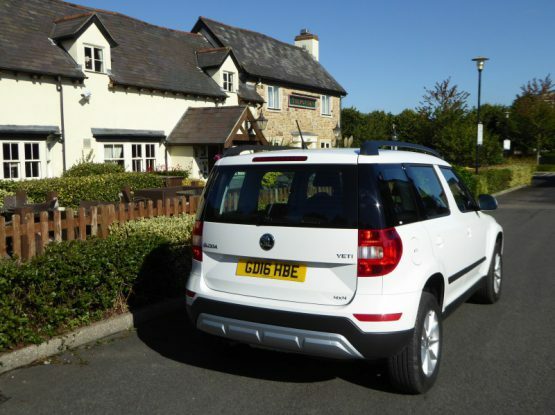 Time for a reassessment came when on returning to the UK from a couple of weeks away, I needed a car for several days, as part of the transition from my company supplied Audi which I had returned prior to going away and being able to collect my new car. A newly registered V40, with the days old 66 plate on it, was sitting in the stall with my name on it. 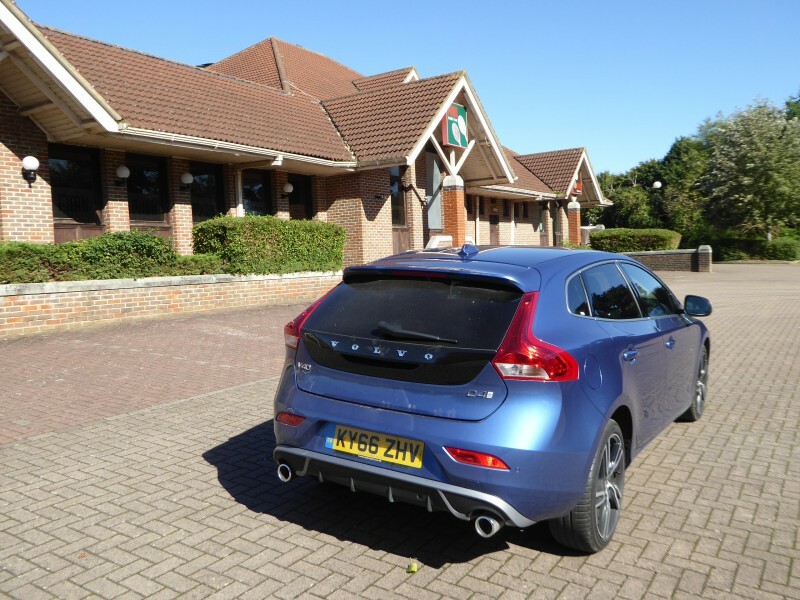 Closer inspection revealed that this was different from that Spanish car in more ways than the position of the steering wheel, as its full model description, as printed even on the Hertz key fob was Volvo V40 D4 R-Design Pro. In a rather striking colour which Volvo call Bursting Blue, it looked more interesting than any of the other cars around it, so I gladly put the luggage in it, did the pre-departure checks and set off. Gone are the days when the number after the letter T (for petrol Turbo models) and D (for diesels) in Volvo’s naming scheme denotes the number of cylinders. Now it is simply an increment which means that the higher the number, the more power there is than a car with a lower number. Higher spec V40s did indeed have a 5 cylinder engine, but when Volvo undertook the mid-life update of the car, they standardised on 4 cylinders across the range, as indeed is now the case for every model they produce. The D4 of 2016 does have a larger capacity unit than the D2 and D3 cars, though. It is powered by a 2 litre unit, which puts out 187 bhp, and just 99 g/km of CO2. An automatic gearbox is available, but in the test car, the standard 6 speed manual was fitted. It is notably more refined than the smaller 1.6 litre unit that I had experienced in the Spanish D3 car. There’s barely a trace of dieselness about it on start up, and it remains pleasingly muted once underway, too. You might think that 187 bhp should make a car of this size quite rapid, but such is the weight penalty of modern cars that I would not use a stronger phrase than “moderately brisk”. To get the best out of it, you will need to use the gears. You don’t need to, as there is plenty of torque available, with the engine pulling from low revs in a higher gear than you would imagine could work, but acceleration will be very slow until you build some momentum if you drive this way. First gear is very short, useful really for just getting moving, with an almost instant change up being indicated on the rightmost part of the instrument cluster which advises on optimum gearchanges, but after this, you just decide whether you want rapid acceleration (use the gears) or laziness (let the torque do more of the work). Using the gears is no hardship. The gearchange is very good, with a nice precise movement to it. There is quite a long travel forwards and backwards, but the horizontal movements across the gate are very small. the lever slotted neatly between gears with no likelihood of selecting the wrong one by mistake. Of course the reason why the old 5 cylinder engine was replaced by the newer Drive-E 4 cylinder unit was all about economy and efficiency. There’s no denying that 99 g/km C02 figure, and you could reasonably expect excellent fuel economy as well. After I had driven 500 miles, I needed to put 50 litres in the tank to fill it, and a further 100 miles required about another 10 litres, and this computes to 45.4 mpg, which I have to declare is a bit on the disappointing side, especially as most of the test miles were done at a steady speed on our motorways. There is a Stop/Start system, which cut back in very rapidly, so I was happy to leave it switched on throughout the test. The V40 is based on the same platform as underpins the Ford Focus and Mazda 3, which should give it the best of chances of beating some of its competitors in the “fun to drive” stakes. It does not quite pull it off, though. The steering is good, but not as precise and full of feel as that of the previous generation Focus, doubtless the standard setter which has yet to be bettered, but by the standards of the latest cars with their electrically assisted set-ups, it is not bad. The weighting is well-judged, and there is decent feel both in the straight ahead position and as you turn the wheel. The car handles well, going around corners with a neatness and precision which means that this is quite a fun car to punt down a twisty road. But there is a price to pay. And it is a huge price. And that is the ride. This was the R-Design model, with low profile 225/40 R18 wheels and sport suspension. Truly the ride in this version is stiff. I joked with a colleague that you could feel every piece of litter you drove over, and he retorted by saying that another colleague describes his equally stiffly suspended car as one where you can tell whether the 10p piece you rode over was Heads or Tails uppermost. Every ridge and lump and bump was far too evident throughout the cabin. I would go as far as say that this was one of the least yielding cars I’ve ever come across, in this guise, so you really do need to test out an R-Design before signing on the dotted line. There were no such issues with the brakes, which felt powerful and progressive in their operation. There is pull-up handbrake between the seats. It is set on the left side of the centre console, and well forward, exactly where it is for left hand drive cars, nut for the UK market, it was a bit awkward to operate, thanks to its siting, though I was thankful it was still a mechanical device. There were a couple of visibility irritations. First thing I noticed is that the trio of washer jets stand proud on the bonnet, and are very prominent when you look forward. Even more noticeable is the massive extrusion around the driver’s side of the rear view mirror which contains the camera used to detect forward obstacles. It is really quite prominent. Apart from this, once the mirrors are adjusted to suit your driving position, the view out is fine when moving forwards. Judging the back end of the car is a bit more difficult as there are thick and angled C pillars, though there are reversing sensors fitted to warn you of nearby obstacles. Volvo interiors are among the very best available these days, rivalling Audi for their quality and pleasing design, and even though this is the cheapest model in the Volvo range, the V40 does not let the side down. Open the door, and spot the R-Design kick plate and logo in the centre of the dash (which quickly disappears in favour of instrument functions), and you realise that the Volvo has enough subtle details as opposed to the blatant in-your-face or over-fussy and brash details that many rivals think contribute to “premium” and “desirable”. The dash has a nice grain texture to it, and is very soft to the touch. There are metal effect inlays, but quite subtle, and when they extend to the gearlever, you know that this is largely a practical thing, as if metal had been used, it would risk scorching the hands in high summer and freezing them in winter, whereas this looks as good, but in plastic is far more practical. The instruments, all digital, are grouped together under a single binnacle. There is a single large central dial, for the speedometer, and to either side are a pair of vertically stacked bar chart type gauges. On the left is a larger “economy indicator” gauge which shows how economically you are driving, with an “e” appearing after sustained good performance, and the fuel gauge, whilst on the right are a rev counter and a gearchange indicator, which both shows the currently selected ratio as well as a recommendation on whether to change up or down. The markings are particularly clear and easy to read. There are various numeric readings at the bottom such as the odometer and current fuel consumption. All very simple, and easy to assimilate. Very crisp acting column stalks on either side of the column are used for indicators and the various wiper functions. Lights operate from a rotary dial on the dash to the right of the wheel. The centre of the dash contains a recessed colour display screen up high, which shows either the navigation map, or current audio selection. Below this are a pair of vents, straddling the hazard warning light switch. Below this are a set of buttons and knobs for the climate control and the audio system. The centrepiece of this is a pictogram representation of the human body, with marking showing how you direct air to the place you want. Surrounding it are various buttons to help you achieve this and also to select the functions on the Infotainment system. Although the system was largely intuitive, it took a few attempt, whilst stationary, to change some of the settings. I am sure once you got into the Volvo-way of doing things, it would all become second nature, but I had to stop and think even after a few days to change the radio settings, for instance. You still need the key to start the car. It goes in a slot on the dash to the left of the wheel. Above the slot is the button you press, with your foot also on the clutch pedal to start or for that matter, to stop the engine. It is not particularly conveniently located, though by the end of the test, it started to feel more natural to use. There are some small repeater buttons on the steering wheel boss – on the left for audio repeaters and the right for cruise control, as well as a means of changing the digital display in the dials. You get leather trim with the R-Design, and a good quality of leather it would appear to be, too. With discrete stitching on the seats, the over-riding impression is that you are indeed getting into a quality premium product. You will still have to adjust those seats manually, though. There is a loop under the seat for fore fat, a turn wheel on the side for backrest angle and a lever on the side for height, I would have preferred to change the angle of inclination a bit, lifting the front edge up, but that was not possible. Even so, the seat itself proved supremely comfortable, something you rather expect of Volvo. The steering column had an in/out and an up/down adjustment, so the driving position was good. There is no foot rest for the left foot, a slightly surprising omission, perhaps, though there was plenty of space to tuck your foot well out of the way of the pedals when on the motorway and unlikely to need to change gear. Motorway cruising was peaceful with low noise levels. The engine is particularly well muted and there was no trace of wind noise, so it was road noise which was most obvious and the amount of this really varied from surface to surface. On no occasion would I describe it as intrusive or excessive. Rear seat passengers will probably be decently content, too. There is a good amount of room for them, considering the overall size of the car. With the front seat set well back, there is still enough leg room for most, and if the seat is set well forward, then there is ample space. 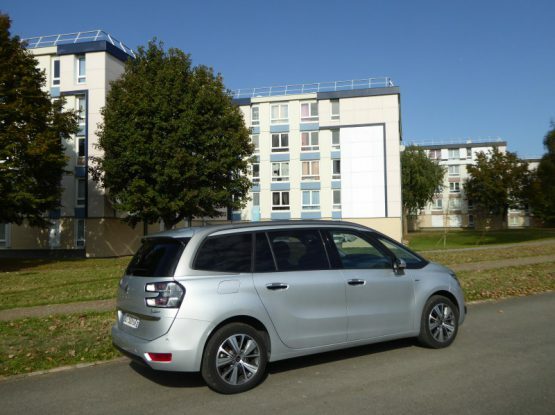 Although the roof slopes gently rearwards, there is no impact on headroom. A middle passenger would not be so comfortable. The rear seat is definitely moulded for two, with the central part having a harder element to it, with a flip up pair of cup holders in the front-most part of the rear seat cushion, so whilst there is not much of a transmission tunnel in the way, the seat design itself encourages you to think of this as a four seater. That might be no bad thing when you see the size of the boot. When I collected the car, I had my holiday luggage with me, and the suitcase – which is not particularly large – filled most of the floor area, and when I put my lap top bag in as well, that definitely left little space. Later in the week, I had my week’s typical collection of lap top bag, large bag for clothes and my squash bag and again that filled the floor area. There is a decent depth to the area, as there is no false floor in this car, which does mean there is something of a lip over which to heave things. More space can be created by dropping down the rear seat cushions, though be aware that whilst these form a flat floor, it is several inches higher than the boot. There is not much in the way of space under the boot floor around the spacesaver spare wheel. Inside the cabin there is a modest glove box, some rather small door bins, a cubby under the central armrest and the area behind the centre console, which is a bit awkward to get at, and if you put anything large in it, would likely tip out on the various exuberantly tackled corner. rear seat passengers get map pockets on the seat backs and door bins. Volvo sell the V40 in the UK with a choice of three different power output diesel models, the D2, D3 and D4, as well as three petrol powered cars, the T2, T3 and T5. In the case of the diesels, the power output starts at 120 bhp with the D2, goes to 150 bhp with the D3, which also has the 1.6 litre engine and for the D4 as tested, there is a larger 2 litre engine which generates 187 bhp. The D4 is actually more efficient from a emissions point of view than the D3 (just). The petrol cars are broadly similar, with 122 bhp for the T2, 152 bhp for the T3 and 245 bhp for the T5. All are available with a choice of manual or automatic gearboxes. There are 4 trim levels: Momentum, Inscription, R-Design and R-Design Pro, which are available with all of the engine options. Even the entry level Momentum has a long list of standard features, as is the case with most cars these days. Included are: 16″ Markeb Alloy Wheels with 205/55 Tyres; Comfort / Touring Chassis on the D2 and T2 and Dynamic Chassis for the other models; LED Headlights incorporating Day Running Lights; Adaptive Brake Lights including High Level LED Brake Light; Colour Co-ordinated, Power Adjustable and Heated Door Mirrors; Autofolding Door Mirrors with Ground Lights; Roof Spoiler; Twin Exhaust Pipes with Chrome Sleeves (not D2 or T2); Height and Reach Adjustable Steering Column; Speed Sensitive Steering System; 3 Spoke Leather Steering Wheel with Chrome Deco; Steering Wheel Remote Audio Controls; Hill Start Assist; ECC (Electronic Climate Control) including Pollen Filter; Information Centre; Front and Rear Power Windows; A-Pillar Parking Ticket Holder; Front Reading Lights, Footwell and Theatre Lights (choice of 7 Colours); Illuminated Vanity Mirrors; Frameless Rear View Mirror; 12v Socket (Front and Rear Tunnel Console); Front Door Tread Plates; Load Cover; Textile/T-Tec Upholstery; Floor Mats; Height Adjustable Tiltable Driver Seat with Lumbar Support; Versatile Split-folding Rear Seat (60/40); Front Centre Armrest with Cupholders and Storage; Rear Seat Armrest and Cupholders; Black Grid Aluminium Trim. Standard In Car Entertainment is a system with DAB (Digital Audio Broadcasting) Radio, Bluetooth® Handsfree System, High Performance Sound, a 5″ Colour Display Screen, a CD slot, USB Input and 4 x 45W Amplifier with 8 Speakers. If you want Navigation, you can buy a Navigation Plus upgrade which brings with it the Sensus Connect with High Performance Sound system with access to a range of selected Web Apps and Internet Browser, Connected Service Booking, – Voice Activated Control, a 7″ Colour Display Screen with DVD and a Hard Disc Drive for Music Storage, as well as the Sensus Navigation with European Mapping, TMC (Traffic Message Channel) and Lifetime Annual Map Updates. You also get Cruise Control and Rear Park Assist. In addition to the standard equipment of the Momentum, the Inscription model includes the following: 17″ Sarpas Alloy Wheels with 225/45 Tyres; Chrome Deco in Lower Front Bumper; Chrome Window Trim Surround; Milled Aluminium Trim Inscription Front Grille with Chrome Inserts; Forward Folding/Height Adjustable Front Passenger Seat with Lumbar Support; Rear Park Assist; Active TFT Crystal Driver’s Information Display; Leather-faced Upholstery; Rear Reading, Theatre and Front Door Side Step Illumination; Inscription Front Door Tread Plates; Rain Sensor – Automatic Windscreen Wiper Activation; Adjustable Front Centre Armrest; Cruise Control; Sensus Connect with High Performance Sound and Sensus Navigation; Rear Tailgate Emblem. The R-Design adds: 17″ Ixion III Alloy Wheels (Diamond Cut/Matt Black) with 225/45 Tyres; Dynamic Chassis (D2 and T2); R-Design Front Grille; R-Design Lower Front Nose and Rear Diffuser; Silk Metal Window Trim Surround; R-Design Twin Exhaust Pipes; Silver Matt Door Mirrors; Sports Upholstery; Front Sports Seats with Additional Side Support; Sports Pedals and Floor Mats; Leather Steering Wheel with Chrome Deco and R-Design Logo; Active TFT Crystal Driver’s Information Display; Stealth Aluminium Trim; Rear Reading, Theatre and Front Door Side Step Illumination; R-Design Front Door Tread Plates; Rear Tailgate Emblem; Adjustable Front Centre Armrest; and an Illuminated Gear Knob. You don’t get the Sensus Navigation system as standard, but again there is a Navigation pro version of the trim. The R-Design Pro adds more features, which include: 18″ Ixion IV Alloy Wheels (Diamond Cut/Matt Black) with 225/40 Tyres; Leather-faced Sports Upholstery; Cruise Control; Tinted Windows – Rear Side Doors and Cargo Area; Rear Park Assist; Rain Sensor – Automatic Windscreen Wiper Activation; Forward Folding/Height Adjustable Front Passenger Seat with Lumbar Support; Sensus Navigation and Sensus Connect with High Performance Sound. As if all that lot is not enough, there are also the Cross-Country versions of the car, with their revised styling which makes them look like they are ready for the “rough stuff”. I liked this V40, rather more than the lesser D3 I drove in Spain, with one exception. The ride really was punishing at times. I strongly counsel anyone who is interested in one of these cars, at least in R-Design Pro spec with its lower profile tyres to make sure that they test the car thoroughly to be sure they can live with it. That aside, the V40 has much to commend it. It goes well, is refined, reasonably if not class-leading economical, very comfortable (the ride not withstanding) and the interior is impeccably presented. Equipment levels are good, and there is decent space for 4 adults and their luggage. Whilst it is perhaps not quite up to the standard of the Audi A3 overall, which I think still leads the C-Segment Premium class, the Volvo is a very decent alternative for those who want something different. Just 83,000 people did last year, which makes this far rarer, and more exclusive than anything with a German badge on it. The Volvo fans will just smile a wry smile to themselves, even if they do know that it is not technically a Swedish car.